The high-strength fiber rope for lifting applications was developed specifically for use on tower, mobile and crawler cranes. The comparison to steel wire rope leaves no doubt. In several years of development cooperation, the specialist for steel wire ropes and fiber ropes TEUFELBERGER and the renowned crane manufacturer Liebherr have developed the unique, innovative and patented high strength fiber rope for lifting applications. In this cooperation the best of the two worlds of steel wire ropes and fiber ropes has been combined and, by applying profound user know-how, finally brought to perfection. The result of this cooperation is the innovative high-strength fiber rope soLITE®. soLITE® caters readily and successfully to the increasing demands for larger lifting heights and higher load capacities. The patented soLITE® construction makes the difference, because TEUFELBERGER is the only steel and wire and fiber rope specialist to have developed and implemented a fiber rope that features a unique, innovative and patented fiber rope based steel wire rope construction. While in the case of steel wire ropes, the point of discard can be determined according to DIN ISO 4309 based on broken wires, damage patterns, or corrosion, this has not been reliably possible for fiber ropes. However, soLITE® fiber ropes now permit the redundant determination of the point of discard. The protective cover consists of fibers of various colors which, due to their consistency, wear differently. As soon as the red core becomes visible, soLITE® must be discarded. In combination with the bending cycle counter on the crane or the machine, soLITE® can be used on almost any reeving system. 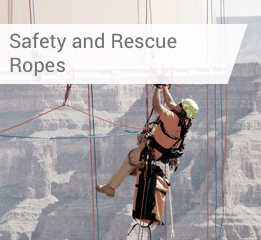 In effect since 2017, the FEM 5.024 standard also defines guidelines, particularly regarding the point of discard for the safe use of high performance fiber ropes on cranes. At the time when the point of discard has just been reached, soLITE®, thanks to its design, still has 100 % of its breaking load. This makes it even safer than a steel wire rope.